Scientists announced on Monday that they had used 20-year-old data to confirm that Jupiter's moon Europa is shooting liquid out into space. It's a hugely exciting finding, not just because it's only the second known example of a natural waterpark in space. The discovery also means the next spacecraft to visit the frozen outpost may be able to get an easy peek at what's beneath the moon's surface simply by flying through the plume. But the discovery raises even more questions than it answers—and it may be a while before scientists can answer those questions, since they'll need to wait for a new spacecraft to reach the moon. Three questions in particular stand out: Where do the plumes really come from? What is causing them? And, of course, will they help us find extraterrestrial life? Let's step back catch up on what scientists know about Europa and its newly confirmed gushers. The moon is covered by dramatically cracked ice, but below it, scientists are pretty sure there's a giant subsurface ocean of salty water. That makes it one of the most enticing worlds in our solar system where life could be hiding. For the past five years or so, scientists working from Hubble Space Telescope images have suspected the moon sports a few plumes breaking out into space. The new paper essentially confirms that, finding that in 1997, a now-retired spacecraft flew through a jet of liquid that upset the magnetic field and plasma around the moon. But if you give a scientist a new planetary feature, they're going to ask how it works. "Just because it's a plume, they haven't yet demonstrated that it comes from an ocean," Carolyn Porco, a planetary scientist at the Space Science Institute in Colorado who wasn't involved in the new research, told Newsweek. Porco was the leader of the imaging team for the Cassini mission, which confirmed that Saturn's moon Enceladus spurts geysers of salty water from its own subsurface ocean out through its south pole. She worries that instead, the Europa plume may be gushing out from an isolated underground lake, or even just a patch of surface ice evaporating away. In order to know for sure, she wants to see evidence of salt in the plume, which would only be possible if it were coming from the hidden ocean. Where the plumes are coming from addresses just one facet of how they work, and here again, scientists can figure out only so much from a distance. They know that the plumes are shorter than those on Enceladus. Only the old spacecraft's closest approach, about 250 miles above Europa's surface, caught the plume's signal. Their size is likely limited by the moon's larger size and stronger gravity that plumes must fight. Scientists aren't sure yet how many plumes there are, or how they are spread over Europa's surface, although the one identified Monday is near the moon's equator. They may be caused by fractures in the moon's icy shell opening and closing as Jupiter's gravity tugs on it, but that's just an educated guess right now. Perhaps the biggest question posed by these plumes is whether they will help scientists discover extraterrestrial life. 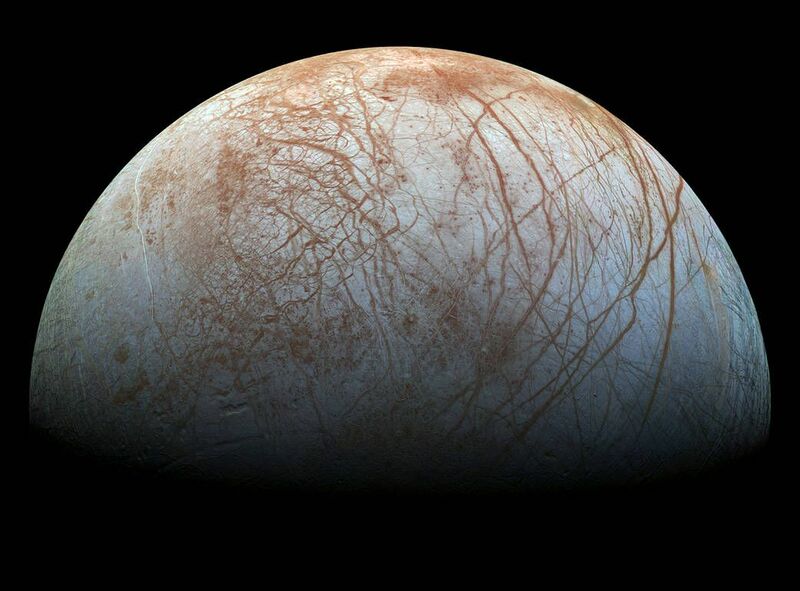 So far, signs suggest that Europa features all the basic ingredients of life—and the plumes could save us the trouble of getting below the icy crust to find it. But this will also likely be the hardest question to tackle. Even if scientists find organic compounds in the plumes, there's no guarantee they come from life. Europa is regularly hit by meteorites that could deliver compounds, and the moon is surrounded by deadly radiation that might kill off anything trying to get by. Those lingering questions are an unfortunate side effect of discovering plumes in data that's two decades old. "Much of what they talk about on Europa has all been speculation," Porco said. That's in contrast to Enceladus, where a spacecraft was still in the neighborhood and able to gather more information when the moon's plumes were first detected. 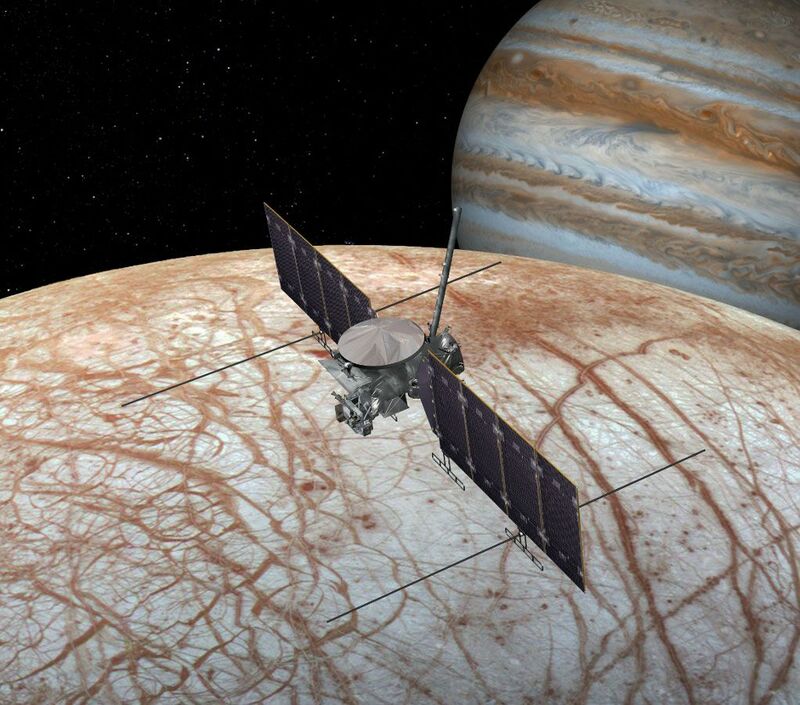 Fortunately for Europa fans, the moon is the destination of two planned missions. One is NASA's Europa Clipper mission, due to launch in the 2020s and at least orbit the moon and possibly send a lander down to the surface as well. The European Space Agency is also planning to launch a spacecraft called the Jupiter Icy Moons Explorer, or JUICE, in 2022, although Europa will need to share its attentions with Ganymede and Callisto. Xianzhe Jia is the first author on Monday's paper and a planetary scientist at the University of Michigan; he's also working on instruments that will fly on both Clipper and JUICE. "They have a huge potential, of course, for collecting very useful data," he told Newsweek. "They're gonna tell us a lot more about the nature of the plumes."